This was inevitable. I mean, I've already made Secretly Healthy Banana Bread with chocolate chips. 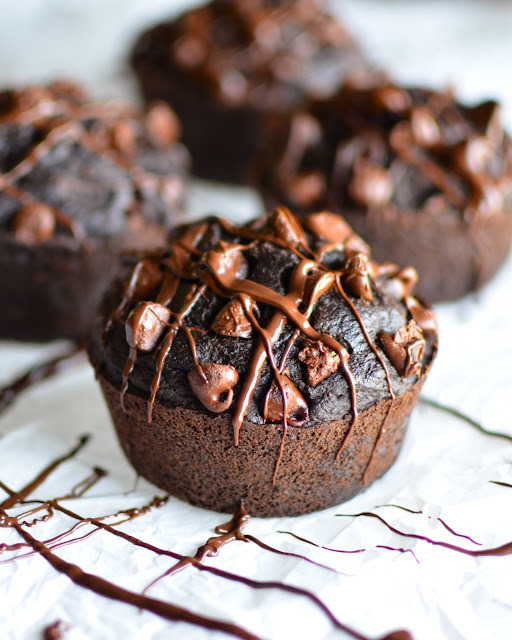 You would think that adding more chocolate would be a no-brainer. Well, a brain I may not have, but tastebuds I do have in abundance, and eventually their pleading and crying led to to this inevitable creation. I used Hershey's Special Dark Cocoa which is a blend of natural and dutched cocoa powder so it's extra chocolatey. 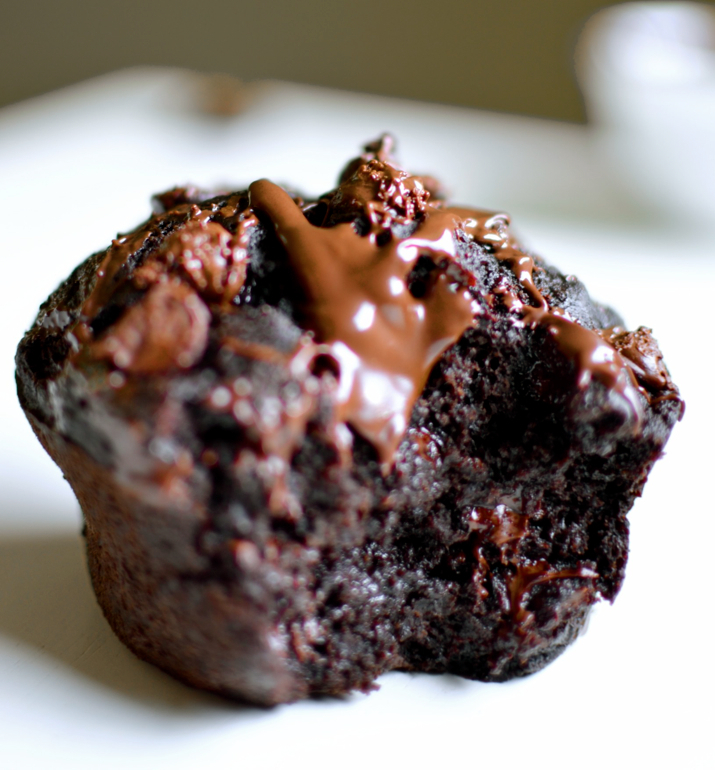 I also used these Dark Chocolate Morsels . They're my favoritest favorites. In an attempt at health, I used applesauce instead of oil or butter and cut down on the sugar. I also used this gluten free oat flour. If my calculations are correct, muffins made in a regular tin should be about 100 calories each and muffins made in a jumbo tin should be about 200 calories each. 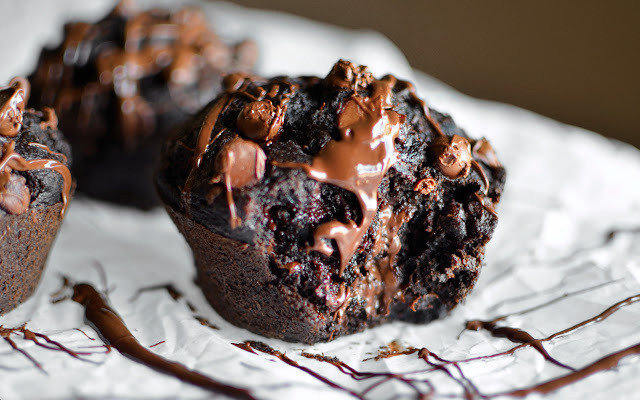 Add about 37 calories for each regular sized muffin for every 1/3 cup of chocolate chips added to the batter. But seriously, who's counting? Preheat oven to 350ºF. Grease muffin tin (the recipe makes 10 regular sized muffins or 5 in a big muffin tin). Whisk together the egg, sugar, applesauce, vanilla, and bananas. Mix the dry ingredients and add to the wet. Mix just until combined. Add some chocolate chips if you want. 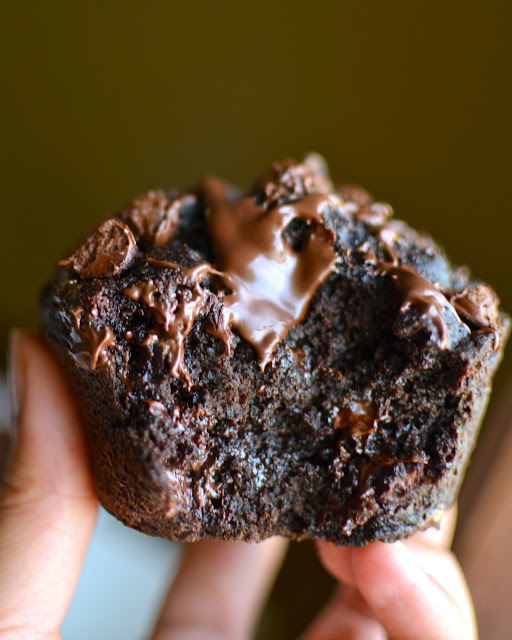 Bake for about 20-25 minutes for regular muffins or 25-30 minutes for big muffins (I just cooked them until a toothpick came out just a little sticky because I wanted them to be "brownie-ish"). I also drizzled them with melted chocolate. 100 calories just wasn't enough for me. Don't forget to follow on Facebook, Twitter, Instagram and Pinterest!